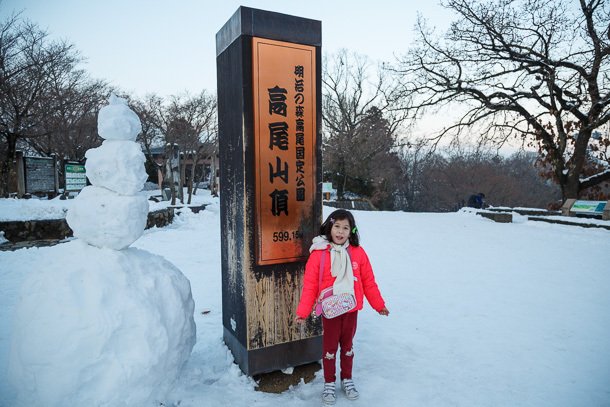 I took a one week vacation to Tokyo and Kyoto at the turnover of 2018 January into February with my daughter Mei. 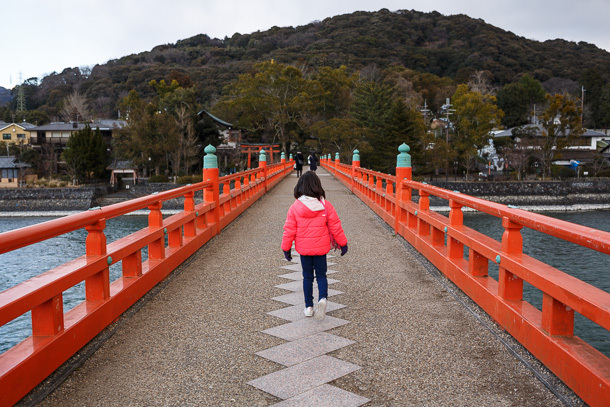 On this trip we checked in at our usual haunts, met an old friend, ate lots of ramen, shopped for odds and ends, climbed a mountain and went on a few casual anime pilgrimages. 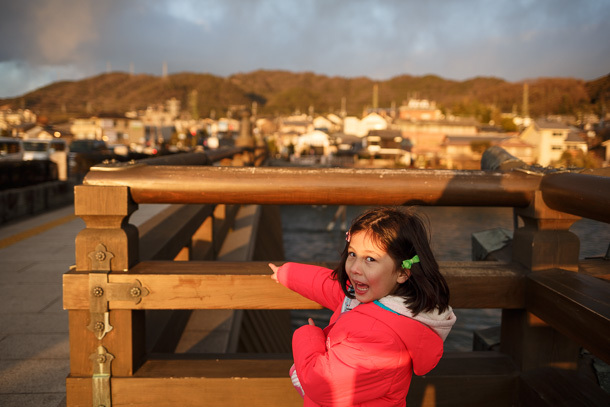 Compared with the usual amount of running around we do, the itinerary was on the light side. 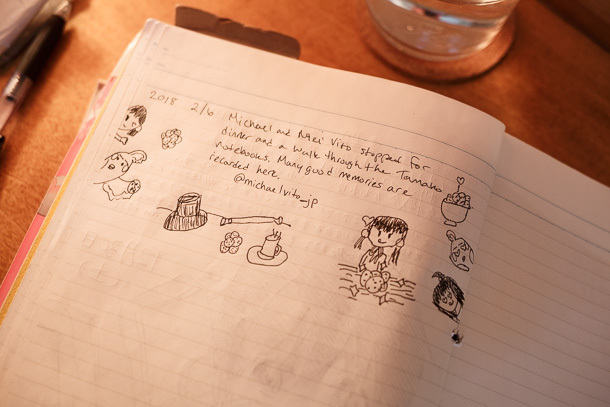 When the two of us have traveled as a pair in the past, we were generally in adventure seeking mode, looking to go new places and try new things. This time was a little different, as we were ramping down from an especially challenging several months and in need of replenishment. 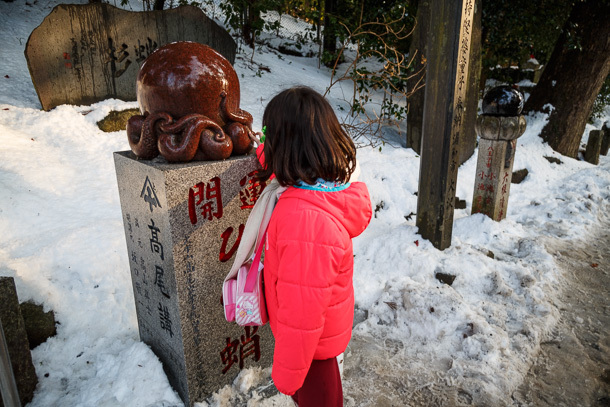 Mei’s first semester of elementary school cut her sleeping time by an hour and forced her to learn new habits that didn’t come easy to her. 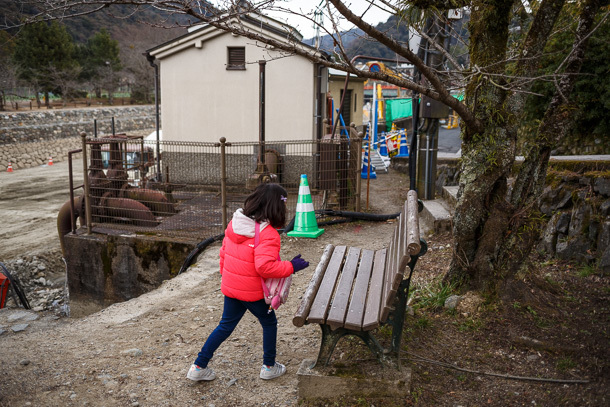 At home, we had reached the limit of being able to contain our two-year-old Mai, and started the process of finding a daycare for him. Everyone was mentally and physically drained. 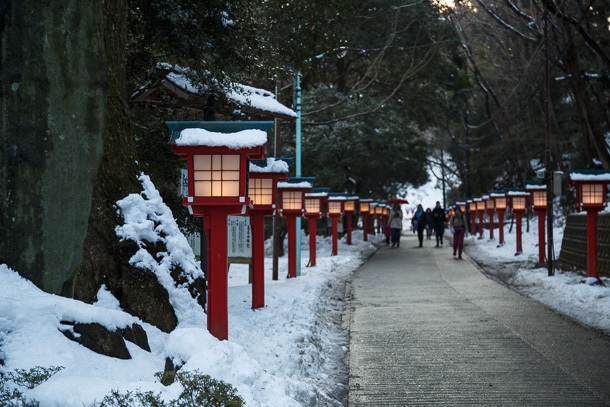 At one point, I wondered if we’d even have the energy to travel over the winter break, but since the alternative was sitting in our apartment staring at each other while Shanghai shut down for the month containing lunar new year, we’d might as well go and do what we could. We needed to recharge, so we stacked the deck with our favorite things. 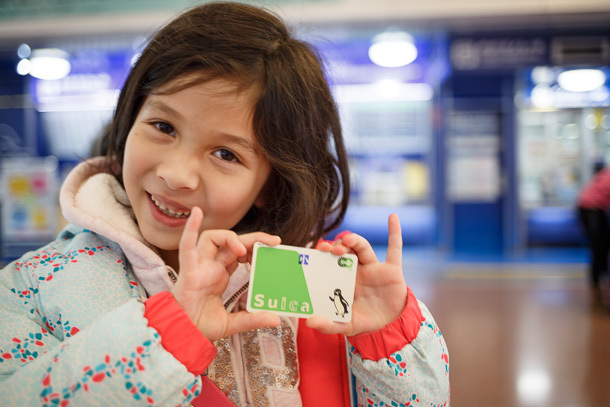 Rite of passage: First Suica card. 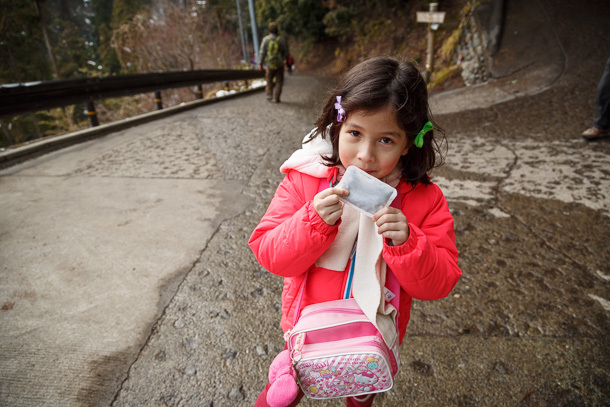 Mei likes that many of the ticket wickets emit a special alarm, usually a bird chirp, when using a child’s IC card. Ikefukuro, long time no see. 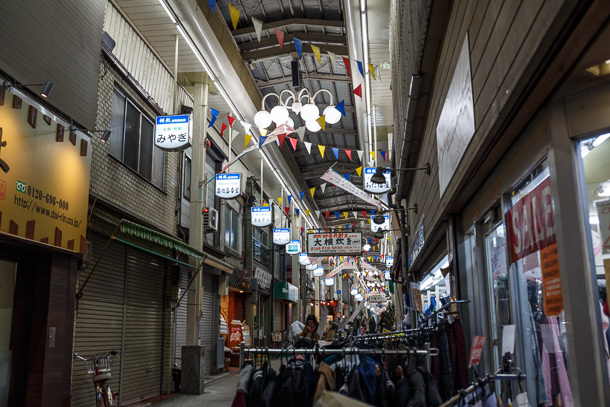 I almost always buy big ticket camera equipment when I’m in the United States, as the prices are usually lower, but it’s still fun to go window shopping in the home market. 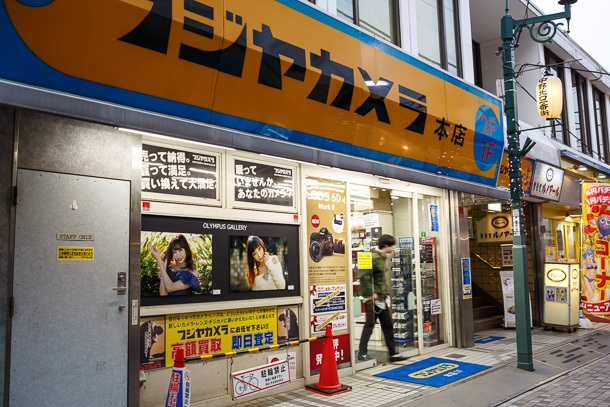 Fujiya Camera is known for its large selection of, well, everything, but especially second-hand lenses. 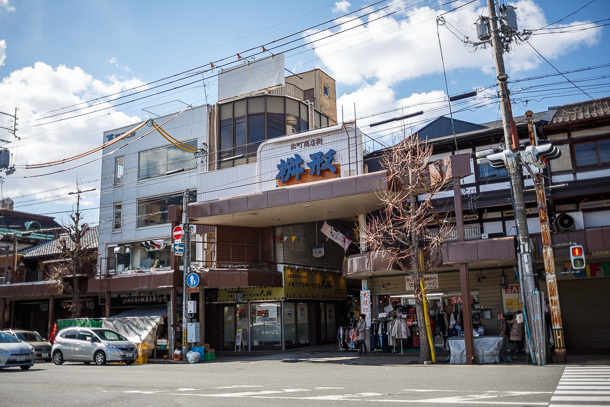 It’s right next to the Nakano Sun Mall Shōtengai, though this is the first time I’ve wandered over for a look. 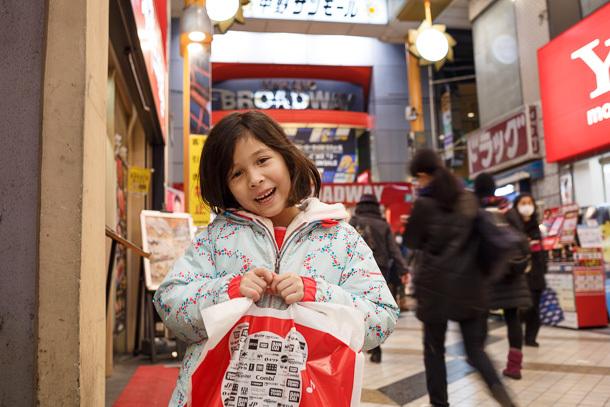 We are Nakano Broadway professionals now—in and out in less than two hours and find everything we need. 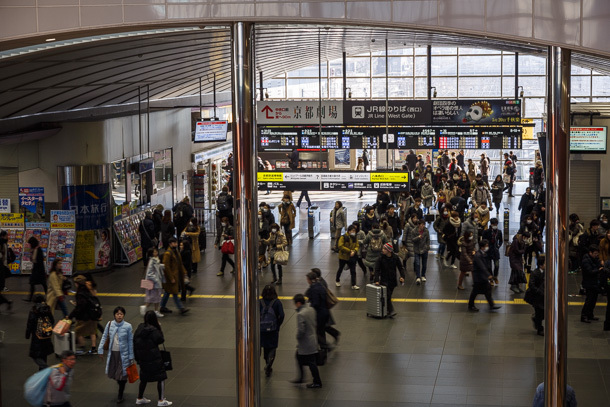 The Chūō Line is a hot mess, with delays of 30 minutes and longer. It’s evening rush hour, so when trains do come they are packed to bursting. 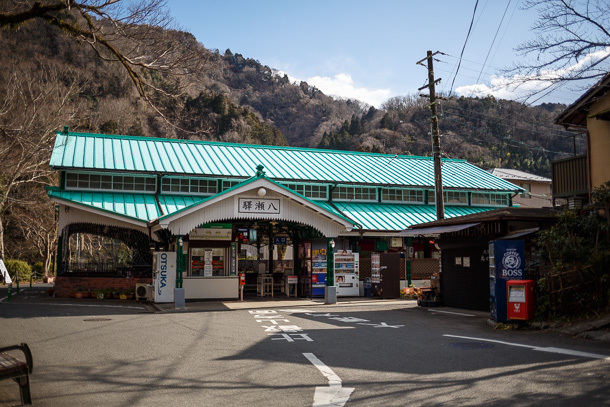 By the time we make it to Ogikubo for dinner, wandering out quite a distance from the station in the cold, we’re so hungry we’re ready to eat the pictures on the ramen shop ticket machine. 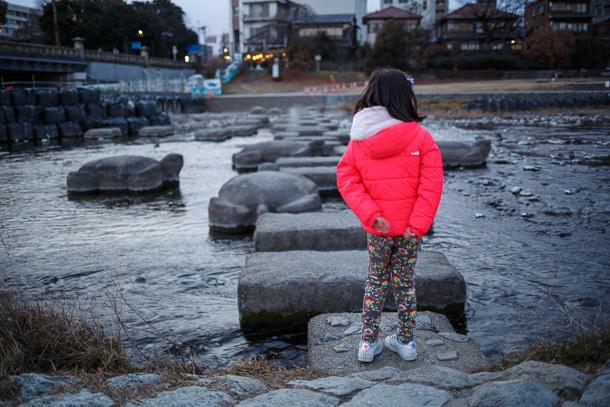 Kaede was a recommendation that had been on our list for a while. 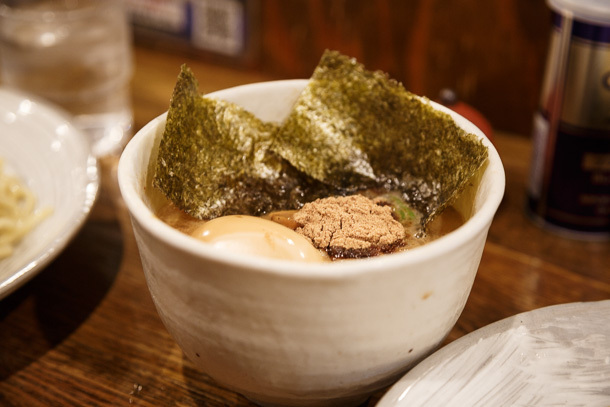 The base miso soup at is smooth and satisfying, but one unique aspect we really like is the use of a ginger paste topping, which gives a gentler flavor than the fresh grated ginger often used in other miso ramen shops. 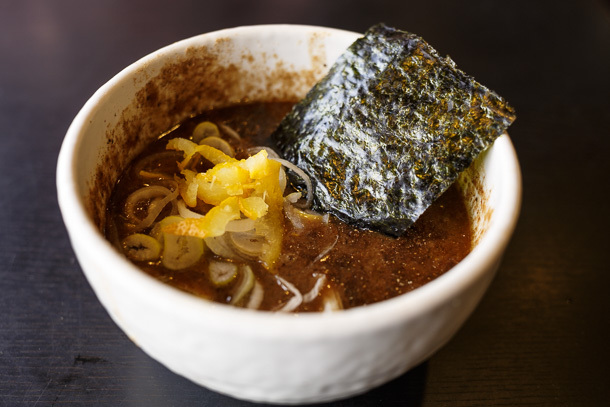 Chile oil adds some heat but, as with dandanmian or tantanmen, it also adds an earthy, smoky flavor that intensifies a good miso without covering it up. 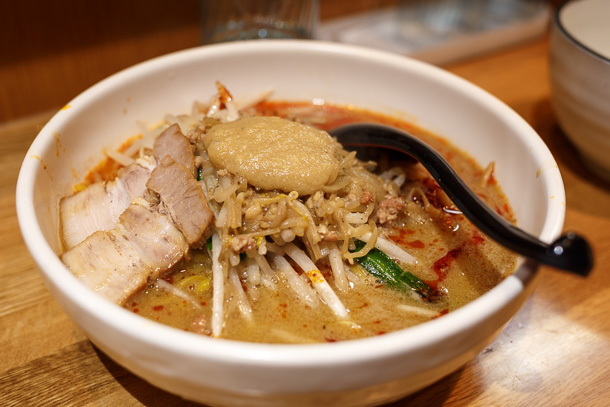 While we like ramen, we really like our friend who really likes ramen. 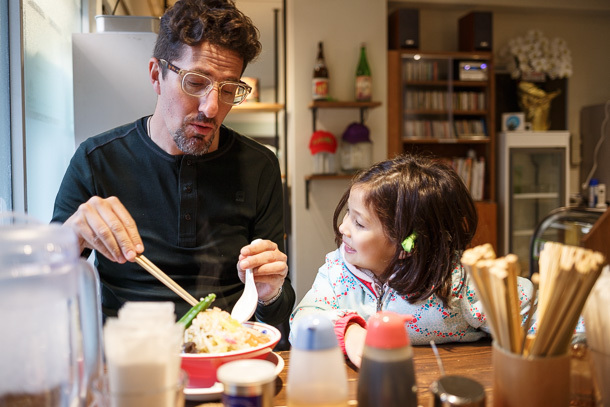 We hadn’t caught up in a while, so we get together and spend the day with Brian MacDuckston, creator of Ramen Adventures. 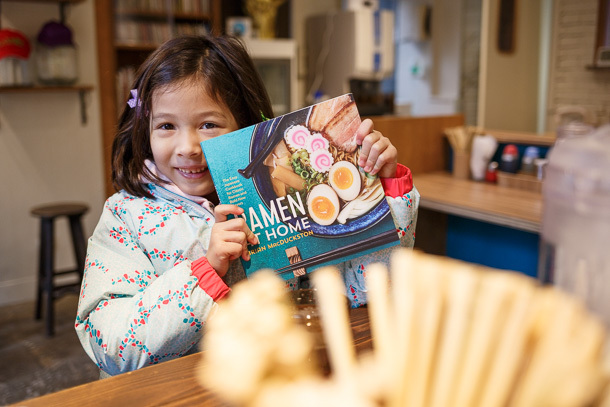 Thanks for the book, it will be put to good use! 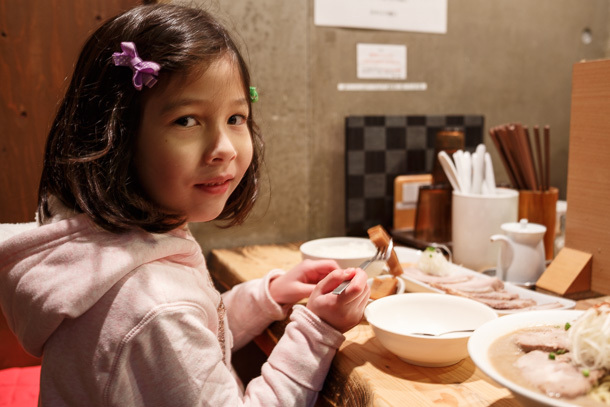 Brian takes us to a brand new shop, Soranoiro Factory & Labo Asakusabashi, the latest offering from the small group of Soranoiro shops, meant as a test kitchen. 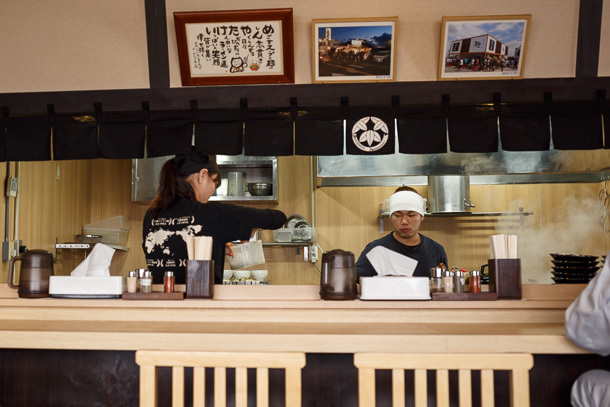 In addition to standard styles of ramen, Soranoiro is known for menus that feature extensive use of fresh vegetables and vegetarian/vegan options. 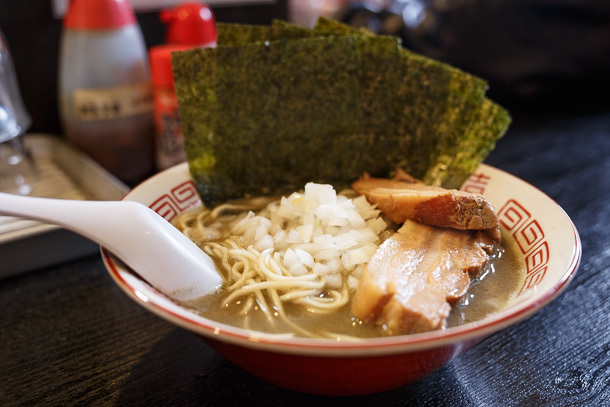 Here, we’re trying an interpretation of Jirō style, which is probably the last substyle of ramen one would ever think could be made lighter and healthier. 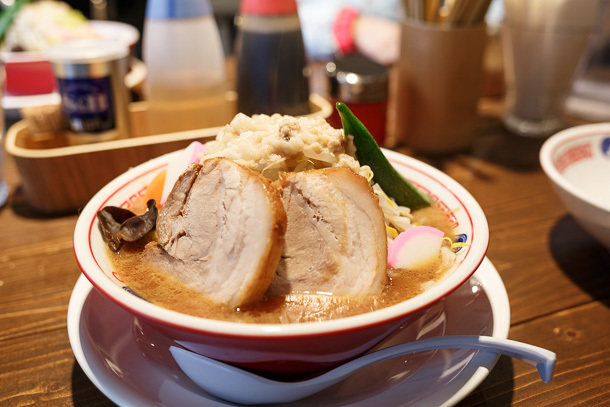 Typical Jirō is served in massive portions with heavy, oily soup. 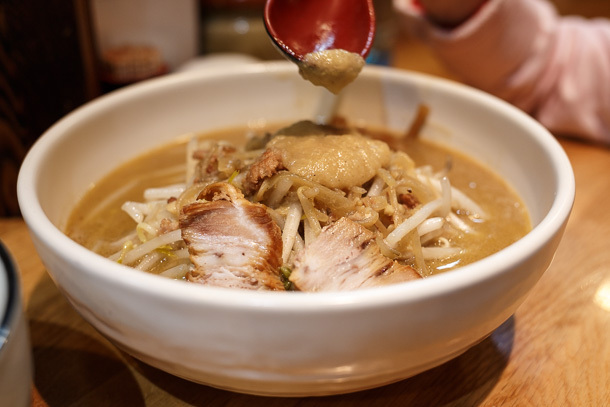 Soranoiro’s take on it still includes an animal based soup and chashu topping, but the soup is lighter and they change the equation by giving you the option to shift the balance of the bowl toward more vegetables and less noodles. 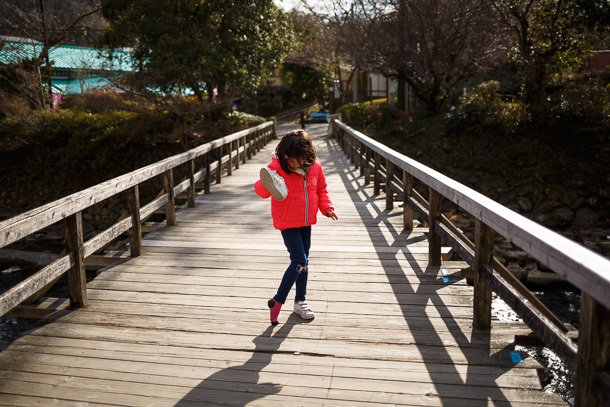 We take a stroll up along the Sumida River, stop for hot drinks, and wander around Asakusa a bit before we decide it’s too cold and rainy to stay out the whole afternoon. 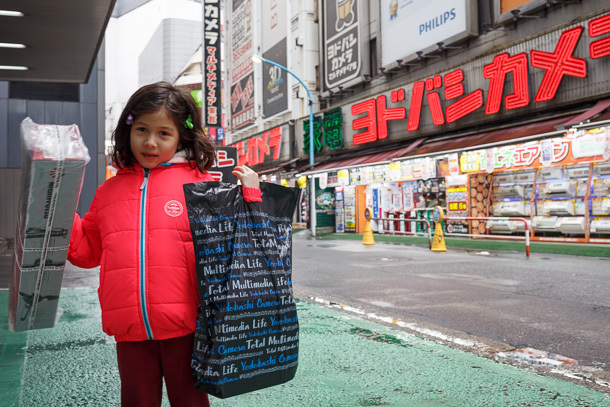 It’s time to grab snacks from Family Mart and go home to play with Jake. 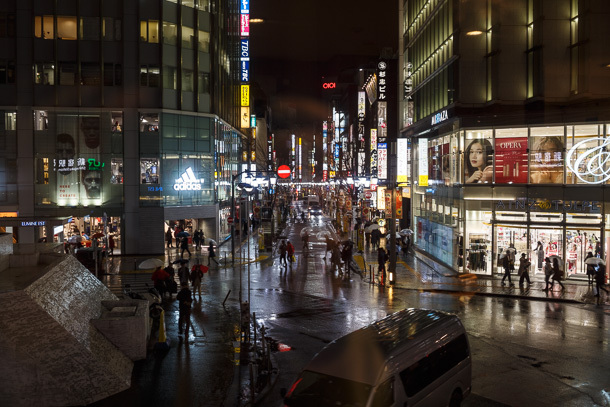 We eventually say goodbye to Brian and wrap up our day with cupcakes and a view out the east side of Shinjuku Station. 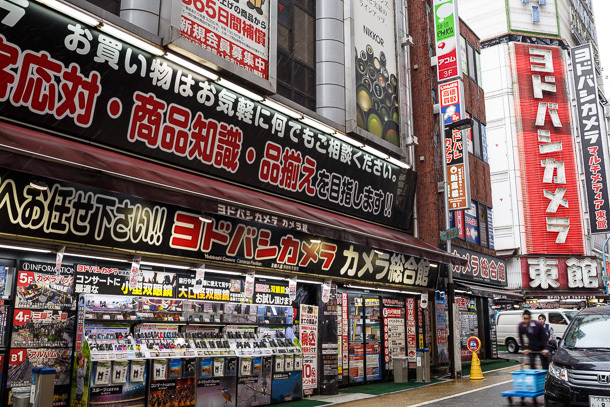 We head to the campus that is the Yodobashi Camera main store in Shinjuku to pick up a few things when it opens. We try not to get lost. Still, we almost get lost. 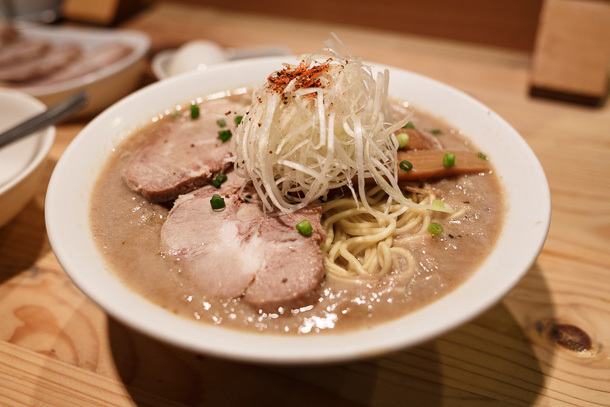 We return for our niboshi ramen fix at Ibuki in Maenochō, Itabashi Ward. There are few places in Japan where you will find anything with this density of smoky, bitter and citrus flavor imparted from dried sardines. 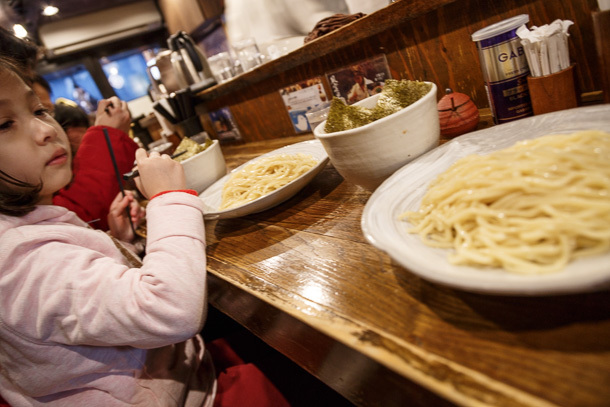 After Mei spends the morning slogging through a section of her winter break homework, we head to Fuunji, one of my favorite tsukemen shops, for early lunch. 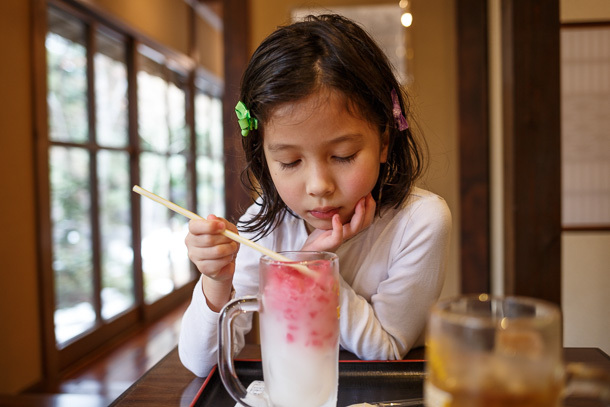 I often end up here when I’m in Shinjuku, but this is Mei’s first time. 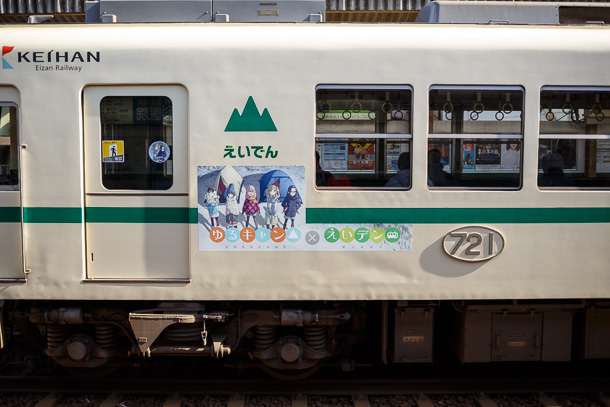 The Keiō Line whisks us out to Takaosan at the west edge of Hachiōji. 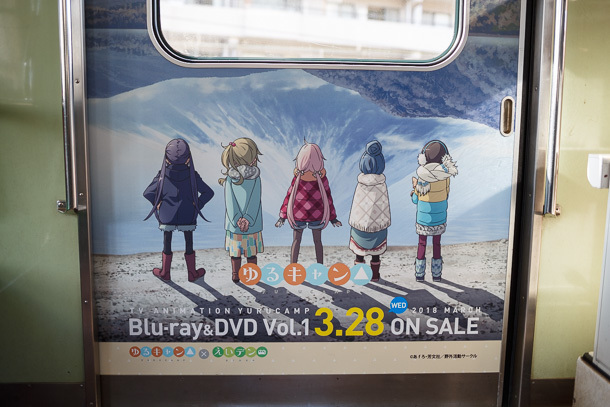 A climb up the mountain was the apex of the first season of short form anime series Yama no Susume (ヤマノススメ)—also called Encouragement of Climb in English speaking markets. The two of us have been making climbing a part of our travels for the past couple of years. We’re still novices, but have found this to be a good way to temporarily leave behind the distractions of the world. Climbing creates a situation where it’s easier to focus on just the task at hand, as well as each other. Climb, talk, rest, repeat. 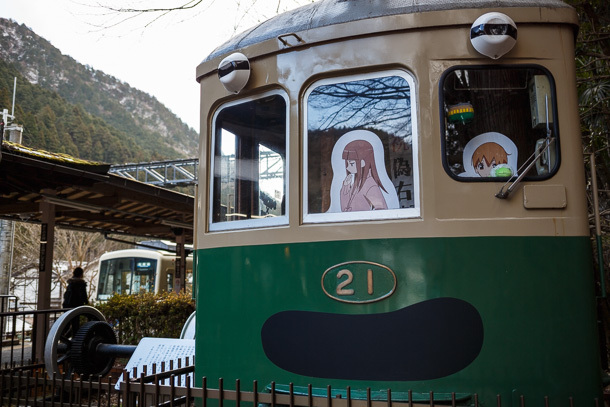 We don’t plan to take the cable car, so the question becomes which trail to take. 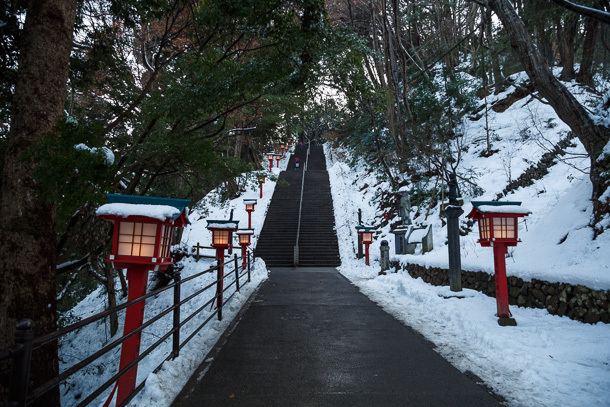 We had initially wanted to go up Inariyama and back down Trail 6, the two meandering paths through the woods. 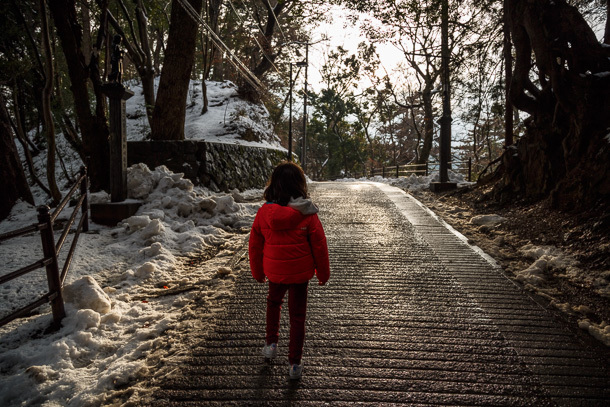 We hadn’t accounted for the recent snowfall and ice lining the paths. When we see the climbers exiting the trails with spiked boots we realize it’s not going to happen this visit. The paved path up Trail 1 is a bit less ambitious, but still a good climb. 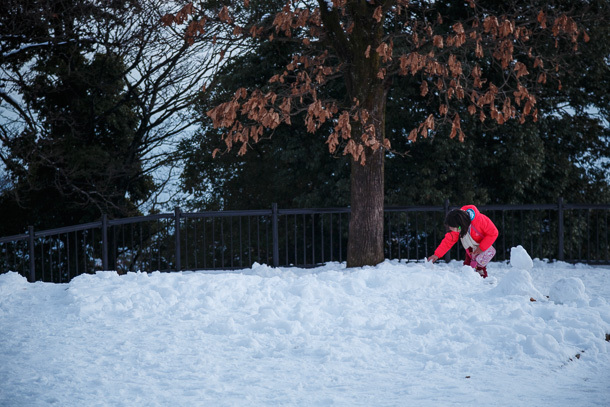 It’s surprisingly humid for winter. 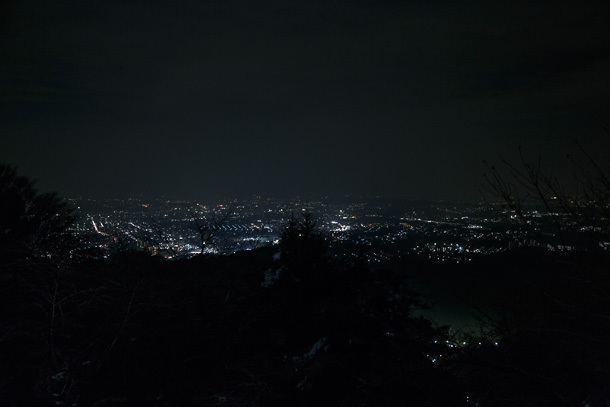 While we can see Hachiōji, Tokyo and Yokohama disappear into the haze. 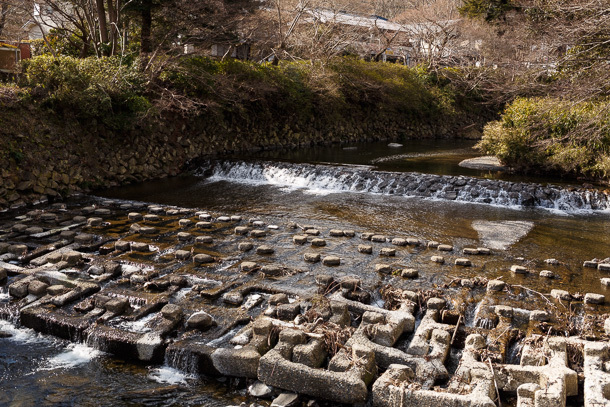 We take the left fork for Otokozaka with its stone steps. 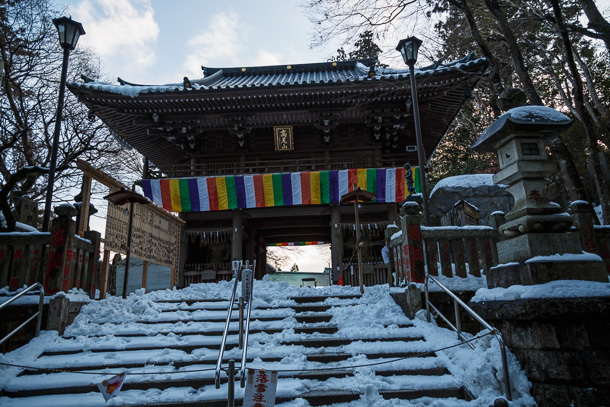 After we pass Buddhist temple Yakuōin, we reach a point where the path is steep and icy. For a time, we aren’t sure if it’s safe to continue or if we should turn back, but a grandmother coming in the opposite direction tells us to go slow, grab the exposed tree roots along the edge of the path and we should be fine. 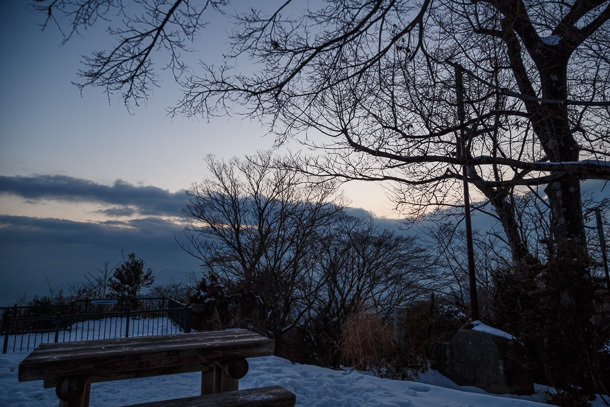 Things become a little dicey on the way, but we’re happy when we finally make it to the summit. 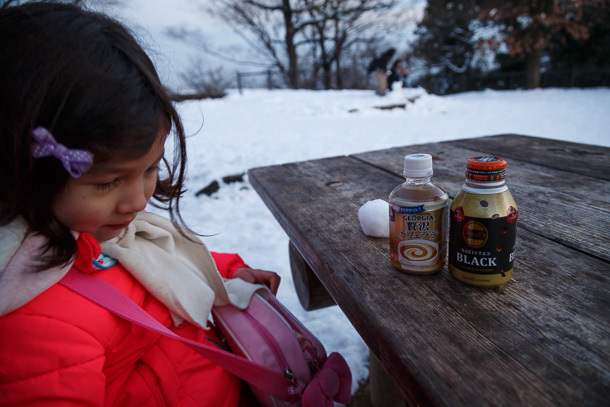 I suppose one might say it’s not a truly orthodox mountain climbing experience if there are vending machines with hot drinks waiting for you at the top. But it’s cold up here and we’re not complaining! 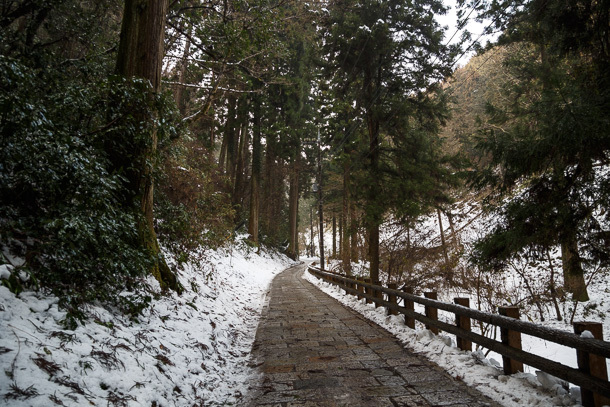 On the descent, we find more of the path had iced over as the temperature dropped. 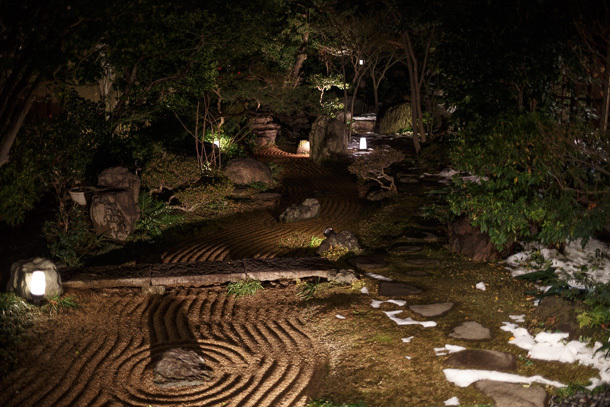 We consider sitting down and sliding on our bottoms at one point, but eventually get into a rhythm of grabbing onto trees, rocks, ropes and whatever other solid things we can find until we can reach the clear parts of the path. It’s a little unnerving, since it’s just the two of us and our flashlight, but also leads to a great sense of accomplishment when we eventually make it back to the trail head. 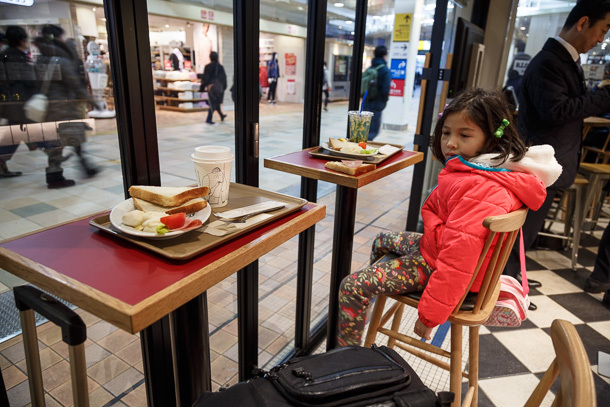 We get a head start on the day with Shinagawa Station breakfast on the way out of town. We have the whole afternoon and evening free. 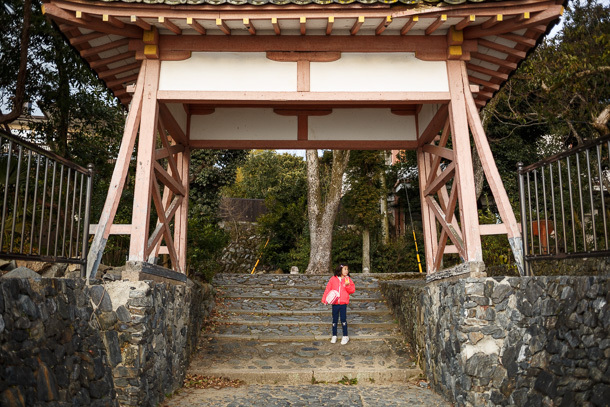 Though I hadn’t planned to come until later in the week, we end up in Demachiyanagi for a stroll around the neighborhood. 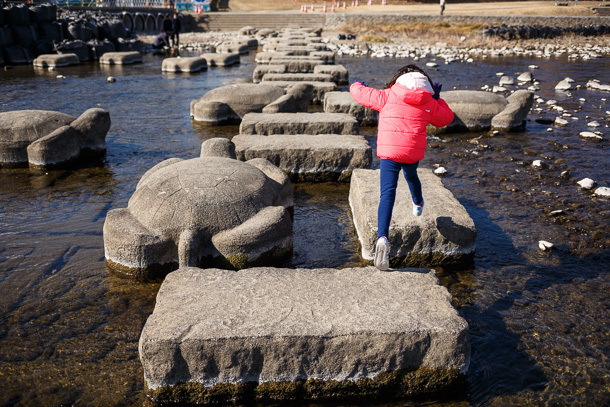 Mei’s legs are longer and stronger than they were when we visited two years ago, but just to be safe, we cross the Kamo River stones together on the first go. 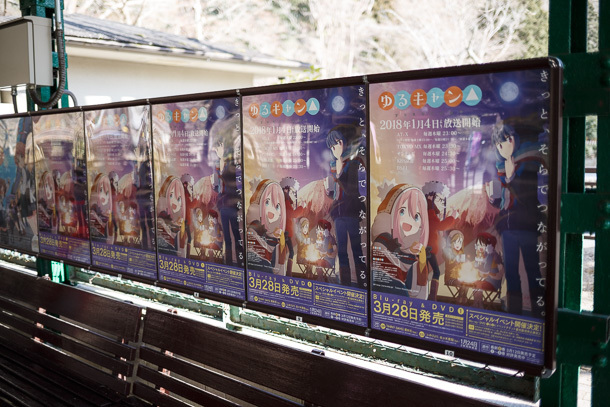 It has been five years since the broadcast of Tamako Market (たまこまーけっと) and four years since I broke into anime-induced tourism research with an analysis of fan behavior at the Demachi Masugata Shōtengai. 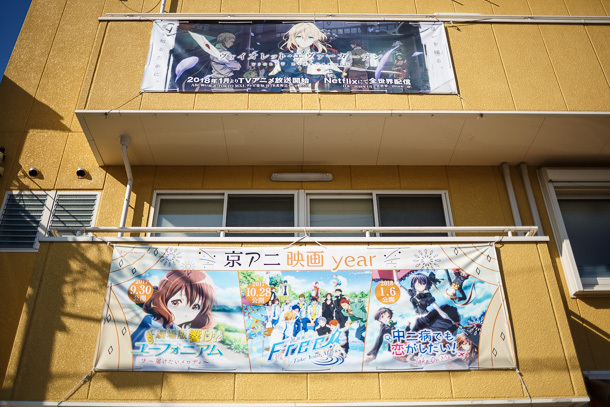 I’m still coming back to Masugata, though these days I don’t really think of it as an anime pilgrimage. Masugata is just Masugata. 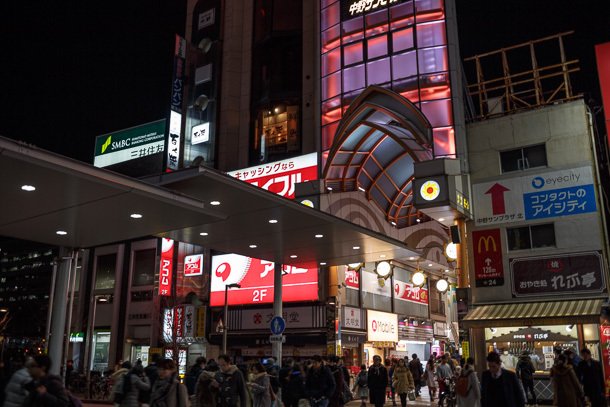 Because of the late hour, many shops have closed for the day. Not too late for donuts, though. 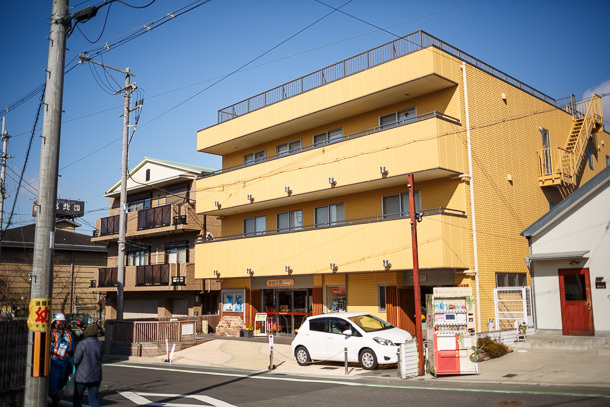 The big success story of the past year is the opening of Demachiza, the end result of a community led effort to create a new civic space within the shōtengai. Demachiza is a cafe, book shop and small cinema shoehorned into a three floor shop space in the arcade. 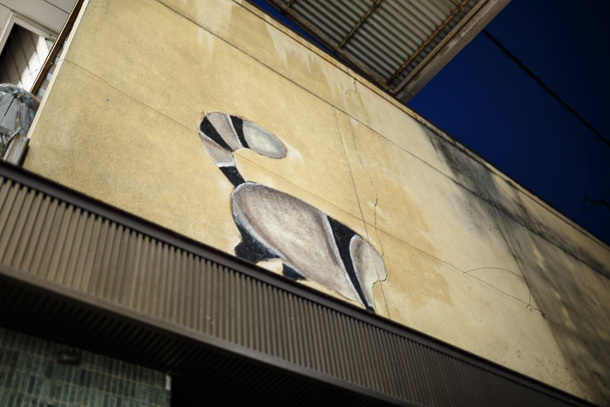 It has roots as a makeshift independent cinema and lecture organizer that had previously operated out of borrowed space in a former elementary school nearby. 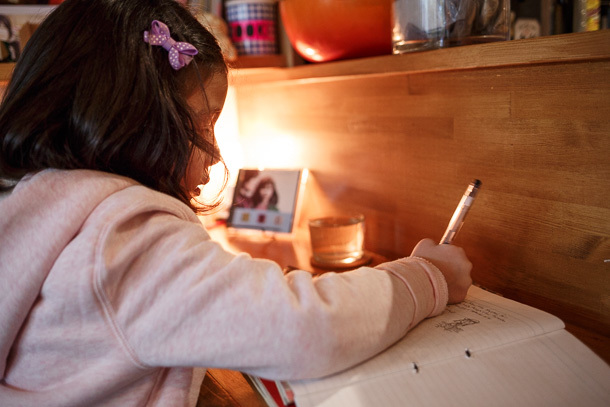 A crowdfunding effort raised the money needed to establish a permanent operation. 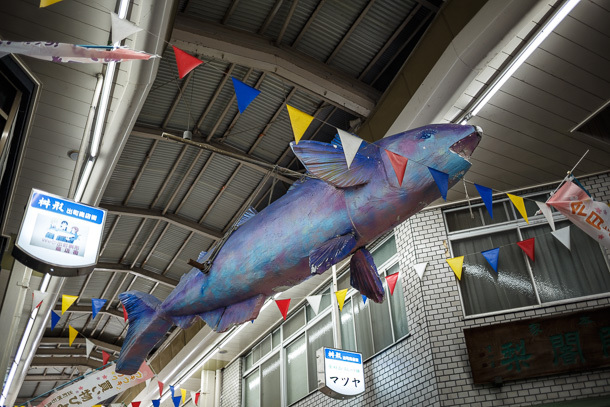 Waka-saba-chan is looking genki with a fully repaired snout. 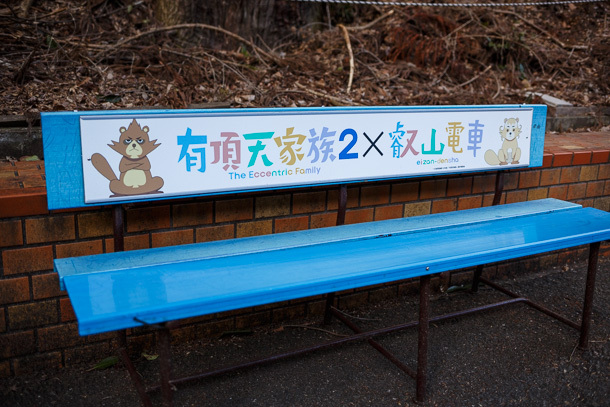 Thanks to a friend, I finally noticed that there is also a raccoon hiding in Masugata. 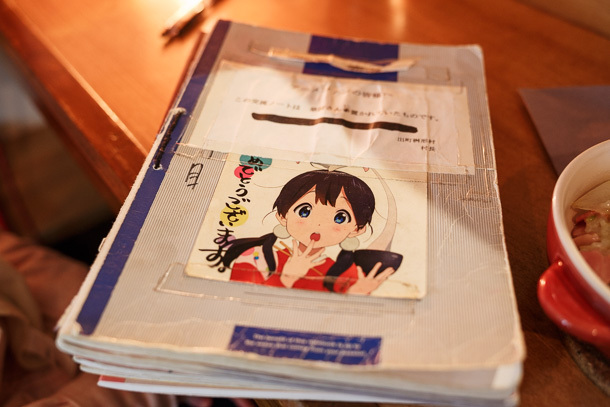 Speaking of that friend, Tesra (テスラ @tesra1141) did a wonderful job rehabilitating the tobidashi Tamako and Dera with a complete repainting. Tesra is not the original creator, but adopted it after the fan art installation had begun to show heavy weather wear. 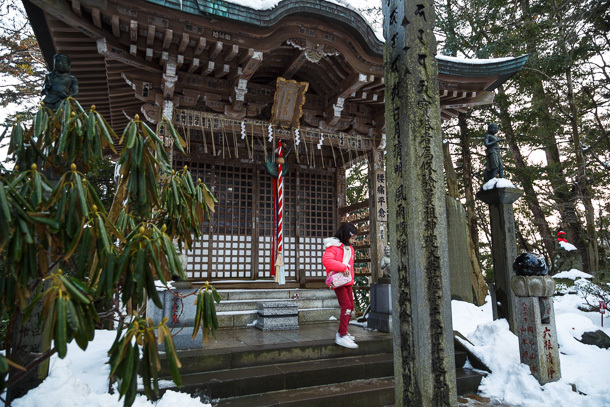 Tesra did make the “jumping out” Choi on the opposite corner, and periodically retrieves her for refurbishment, though she seems to get covered up by banners whenever there is a special event at Masugata. 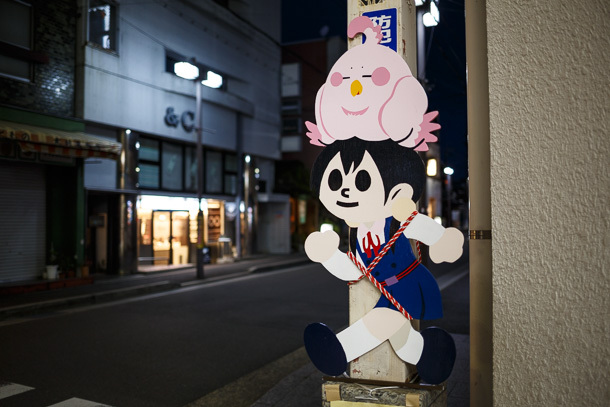 This type of fan art, a colorful interpretation of the generic signs of jumping children warning drivers to be cautious, is often found at anime pilgrimage locations. 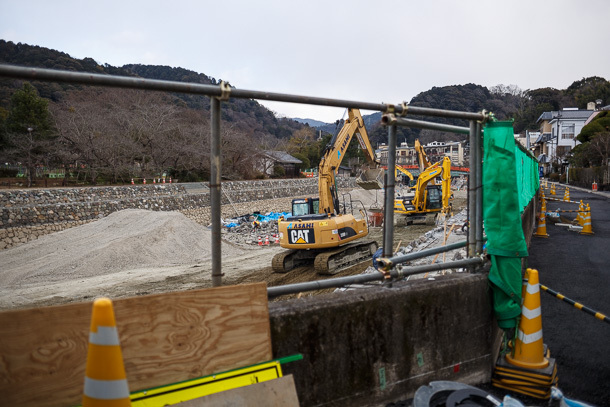 Before I met Tesra, I didn’t realize how much work and periodic maintenance goes into creating a sturdy and long-lived tobidashi. 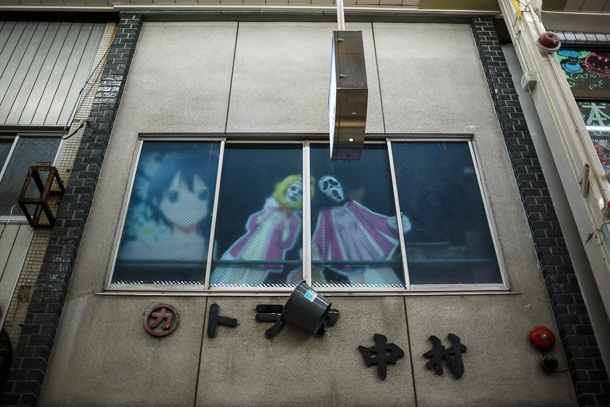 The ghosts of Tamako and Kamogawa Makoto, a regional character mascot previously used by Masugata, creepily watch over shōtengai denizens. 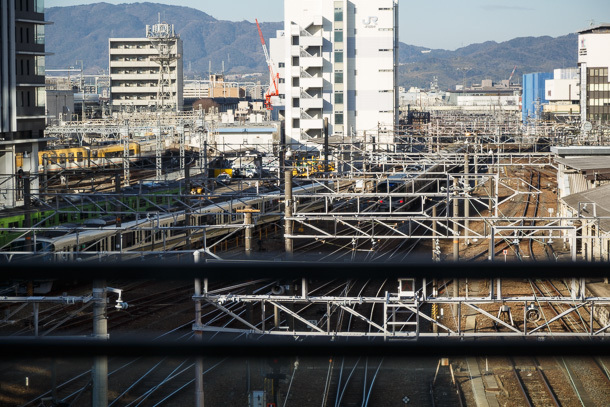 The first of our two full days around Kyoto we spend moving along the JR Nara Line. 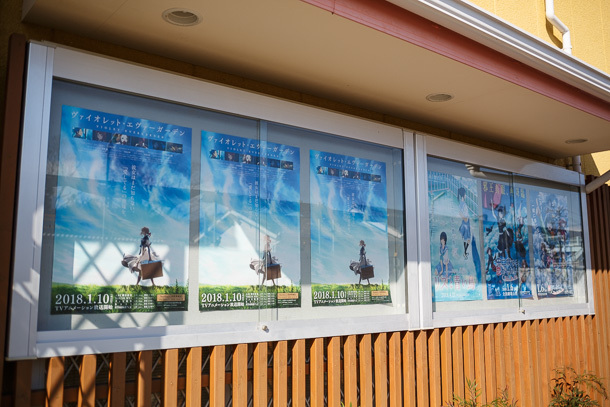 The first stop is Kohata in Uji, where the Kyoto Animation headquarters is displaying banners for Violet Evergarden and all of the films that have been released in the past several months. 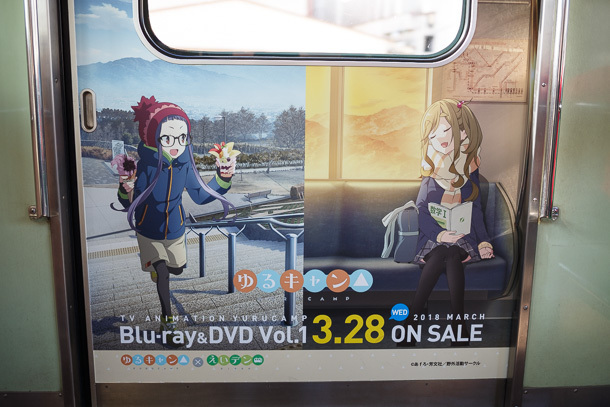 There is also a poster for Liz to Aoi Tori among the others. 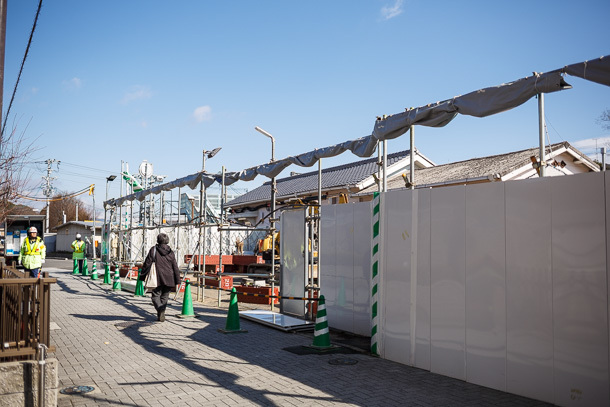 The plaza between the studio and Kohata Station is under renovation. 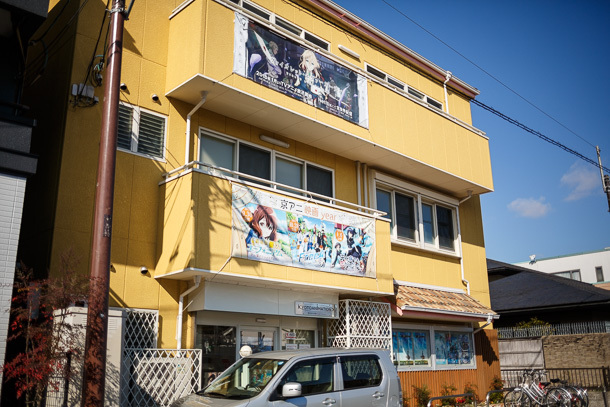 We make our first visit to the new Kyoani & Do Shop, in the first floor of the Kohata Building, the studio’s recent expansion. 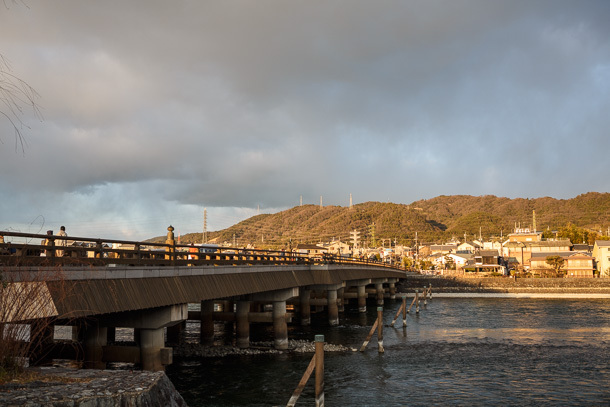 Back on the train, we pass over the center of Uji and make our way to the Takei head shop, a one kilometer walk along a highway from Nagaike Station in Jōyō. 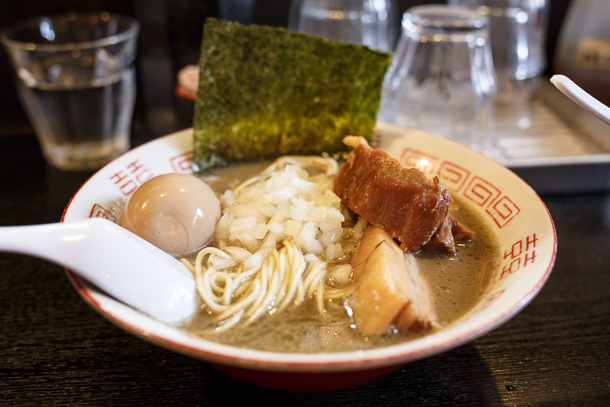 Takei is a regional favorite among tsukemen fans. The two guys in line next to us had come all the way from Shiga Prefecture just for lunch. 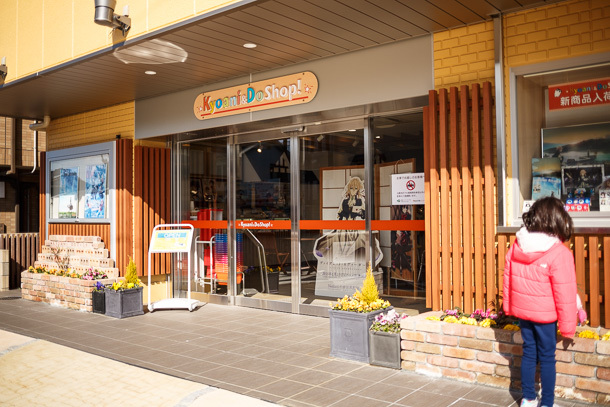 The shop has roots at the long-running RamenDB leader Tomita in Matsudo, Chiba Prefecture (which I once went to but found it closed while staff were traveling for a ramen exhibition). 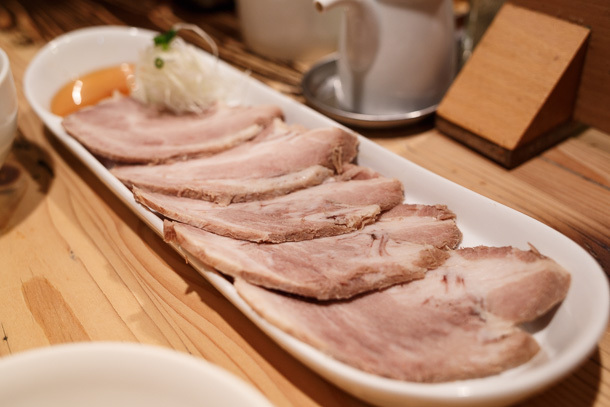 Takei serves a dense tsukedare saturated with katsuo and niboshi powders, laced with yuzu peel to give a zesty aroma to the smoky, umami laden bowl. 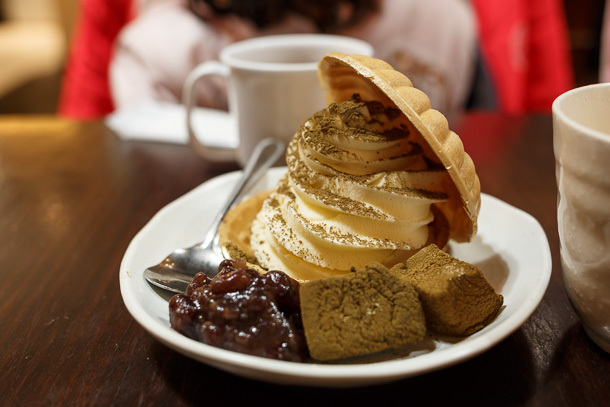 Portions are huge, which we are helpfully warned about and blithely ignore. 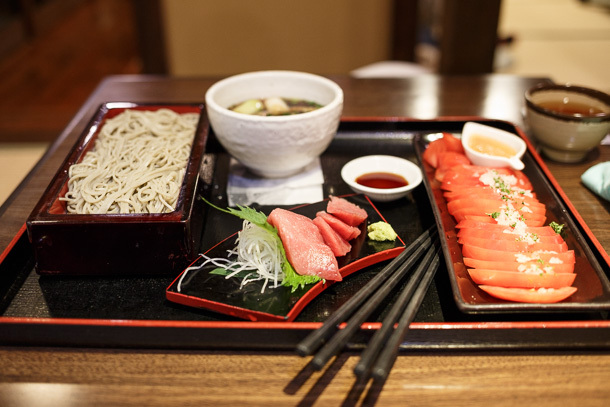 The shō (small) is 210g of noodles, the nami (regular) 280g. 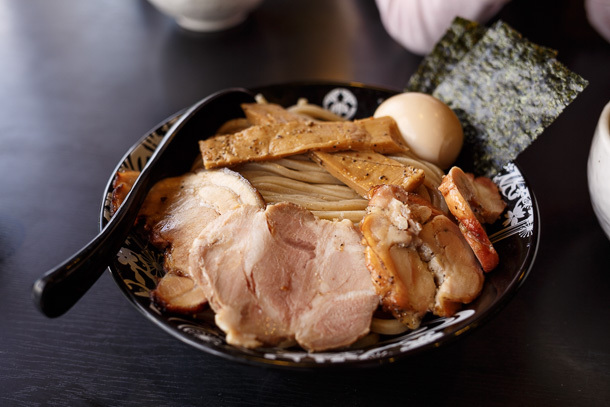 The toppings—multiple types of chashu, thick slabs of menma and ajitama—are decadent. We get one of each size, and just barely finish. But wow is it good. 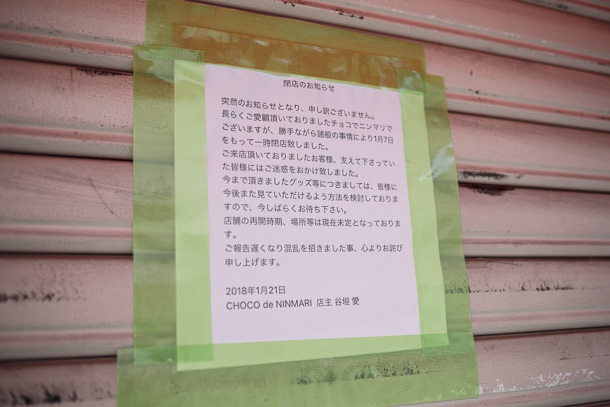 After we roll ourselves out of Takei and take the train back to Uji, we confirm that Choco de Ninmari is still closed. The chocolatier had emerged as a popular meeting place for fans of Sound! Euphonium (響け! 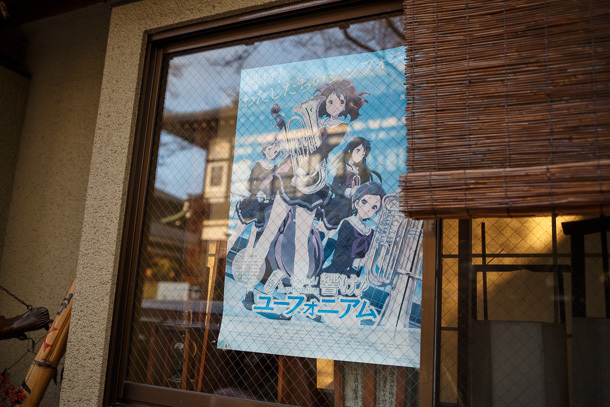 ユーフォニアム), where owner Tanigaki Ai was happy to host anime pilgrims, even accepting a tobidashi of protagonist Kumiko to display on the street and decorating the walls with fan art submissions. 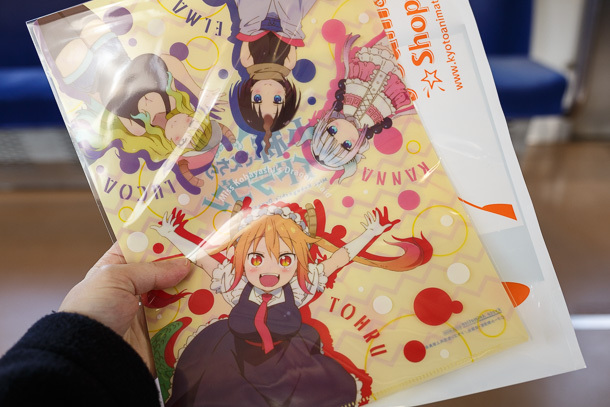 I had planned to visit in 2017 October when I was in the area for a Kyoto Animation event, but the day I had scheduled to go to Uji was scuttled by a typhoon. 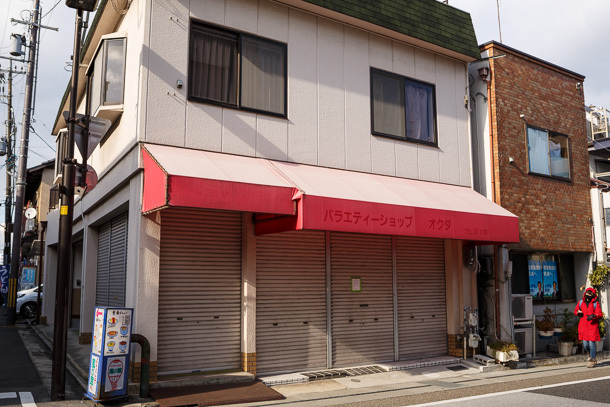 Her notice indicates a temporary closure, but as of the time of writing there’s still no news as to if or when the shop may reopen. 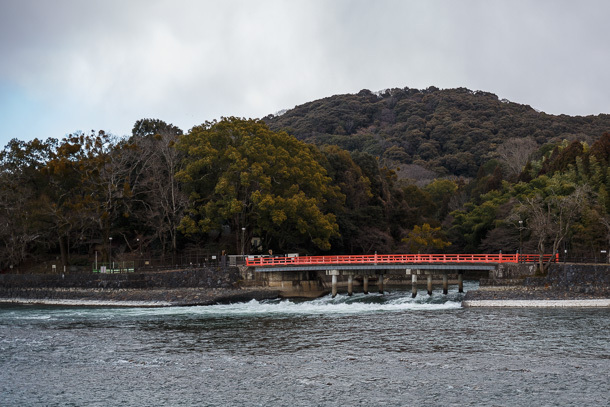 When I first came to Uji in 2015 October for a Sound! 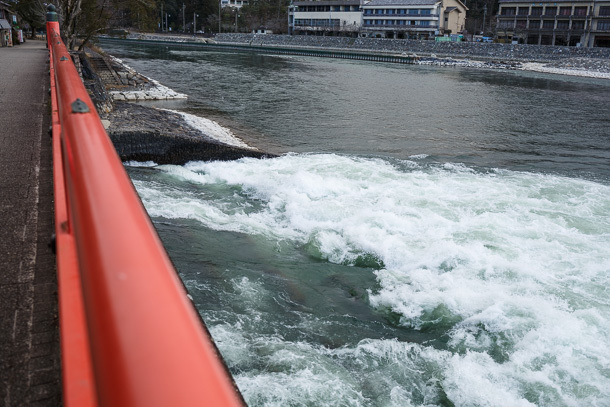 Euphonium first season pilgrimage, the river area was unchanged from how it appears in the work. 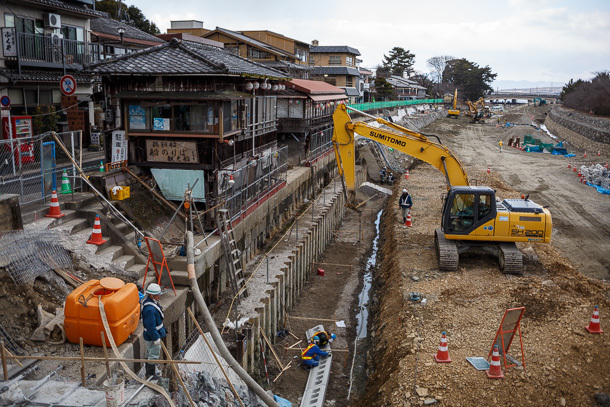 A large civil engineering project underway is focused primarily on the water channel, which will flow again when completed, though changes to the concrete and stone fortifications at the edges will leave permanent visible changes. 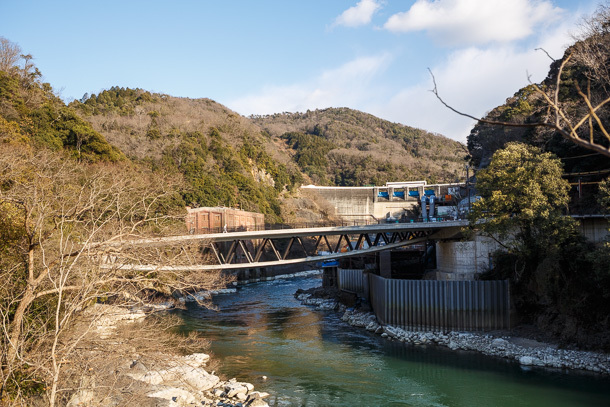 I hadn’t come to Uji since before the second season of Eupho, so I wanted to have a look at some of the new locations that are used. 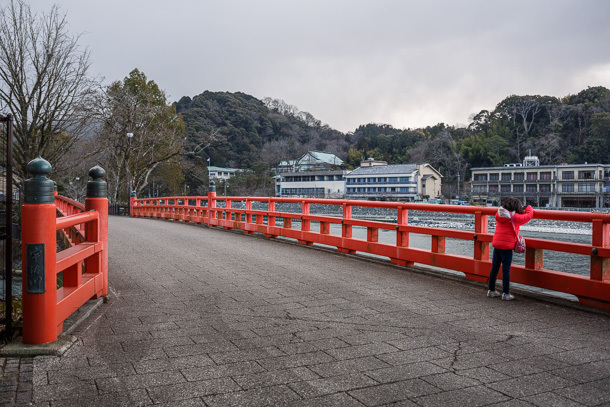 This is the Kanryū Bridge. 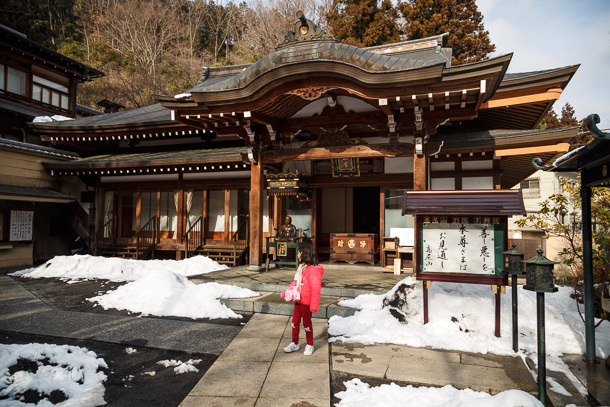 The old Hakkō Bride that appears in the work has been dismantled and replaced with a new one which inherits the name. 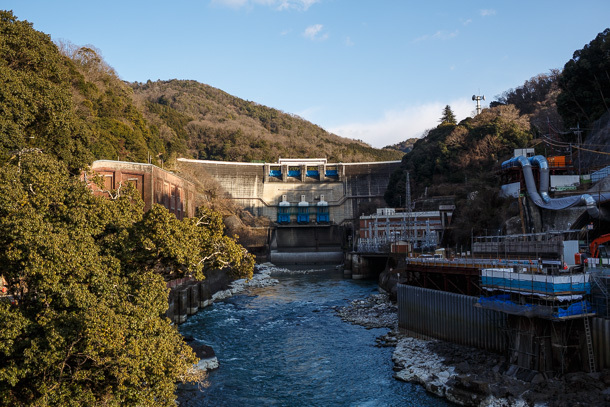 It’s quite a hike to get out to the Amagase Dam, longer than I realized. 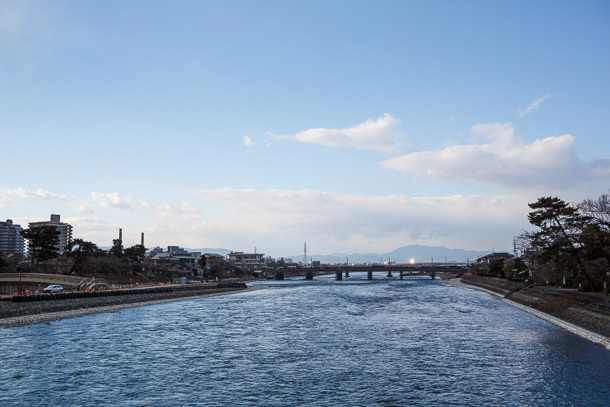 Back near the center of town, most things on the east side of the Uji River appear unchanged. 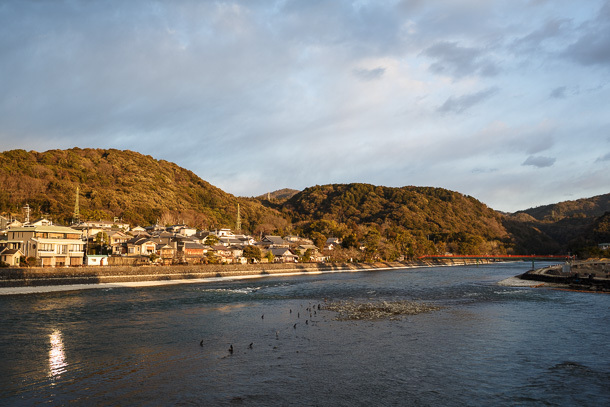 Although the temperature is dropping, it looks like Uji is getting ready for a great sunset this evening, so I bargain with Mei to hold on for another fifteen minutes in order to hit golden hour. See, wasn’t this worth waiting for? 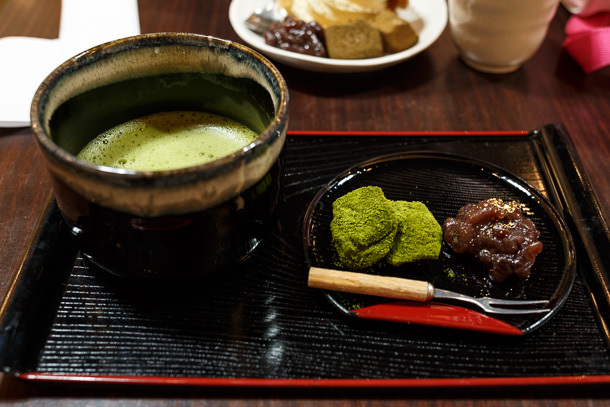 In Uji, you can afford to endure a bit more walking and cold weather, as hot drinks and pick-me-ups made with locally produced tea are rarely more than a stone’s throw away. 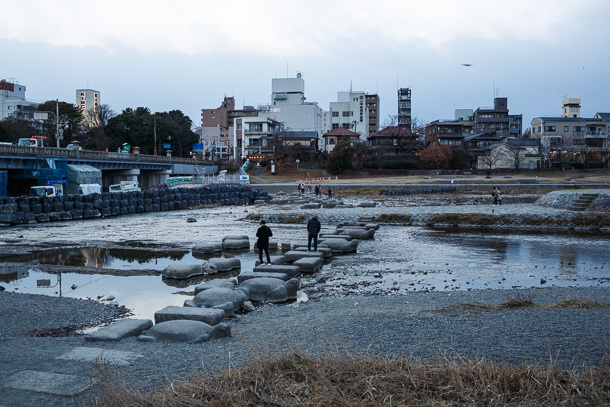 First time across the Kamo River unassisted—my work here is done. 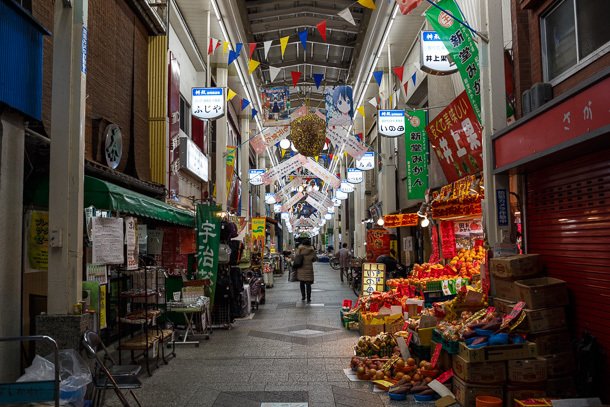 We make an entry in the Tamako Market exchange notebook and chat for a bit with Demachi Masugata Shōtengai president Inoue Atsushi before doing some shopping. 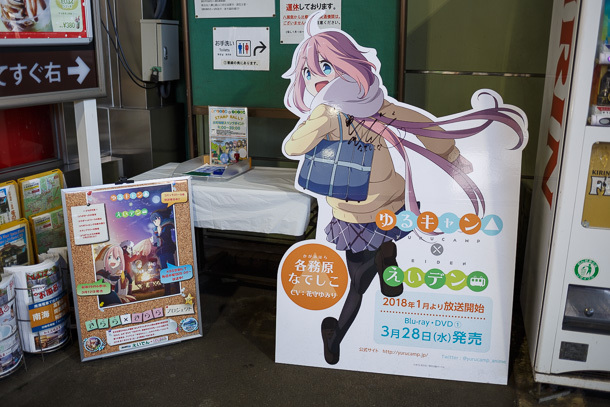 On the way to Ichijōji for lunch, we pass a character panel of Kagamihara Nadeshiko from Yuru Camp, autographed by her voice actor, at the Eizan Electric Railway Demachiyanagi terminal. 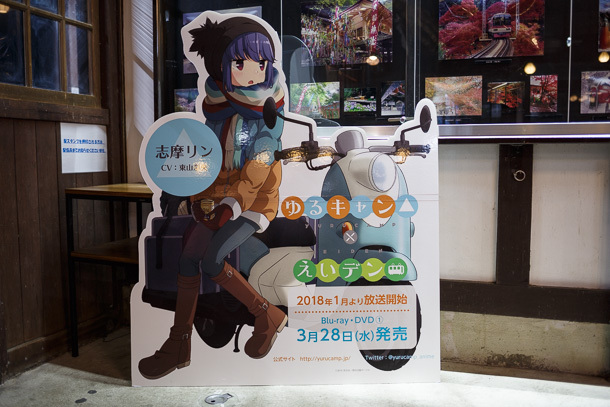 Eiden regularly features marketing campaigns for currently broadcasting anime series and disc releases. 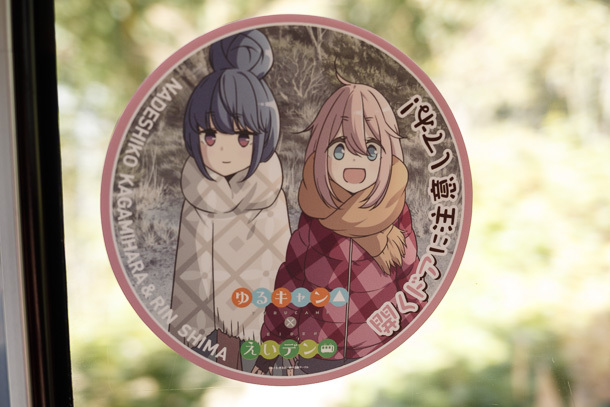 I’m looking to capture as much of the Yuru Camp materials as I can find while we’re here. 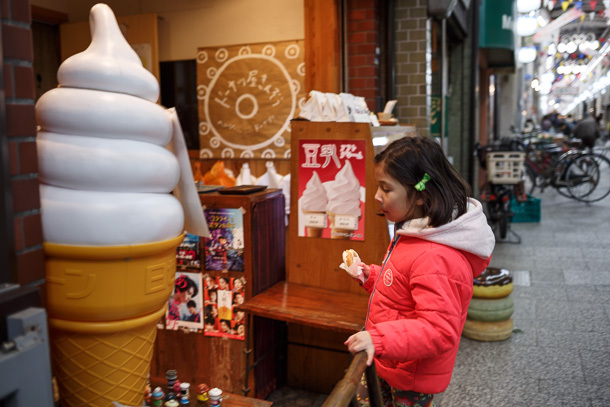 The staff at Gokkei always asks about Mei when I stop in for a bowl. 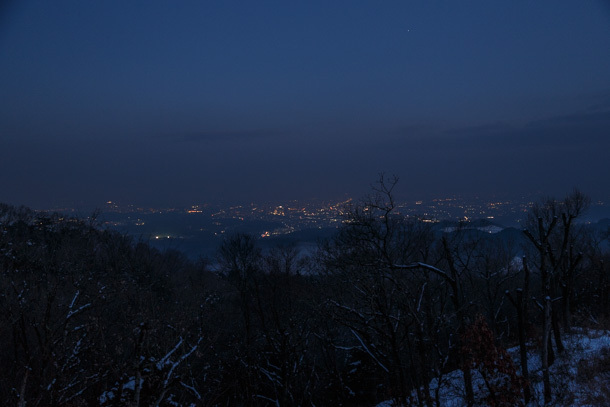 On my previous visit, I mentioned the two of us would probably be back here together for our winter trip. The guy taking orders from people in the queue recognizes us from behind, giving us a “welcome back” before we even see him. I love this place. 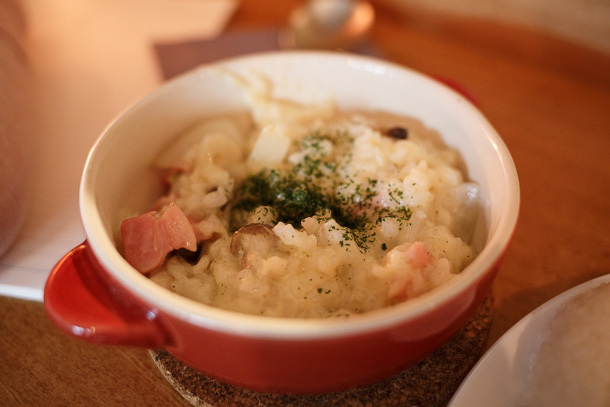 An addictive meal (you can’t really call Gokkei a slurp, the soup is too viscous) and wonderful people. 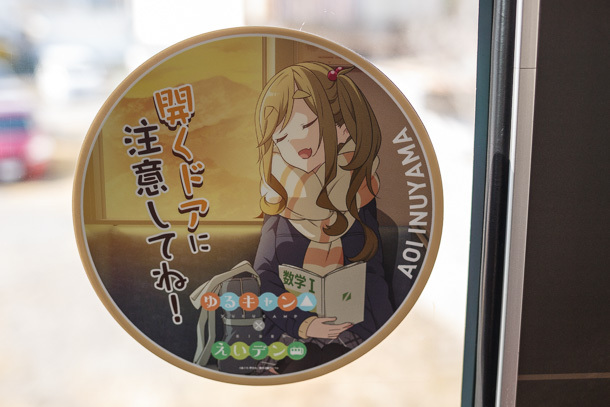 We watch an Eiden train with Yuru Camp decals heading back to Demachiyanagi. 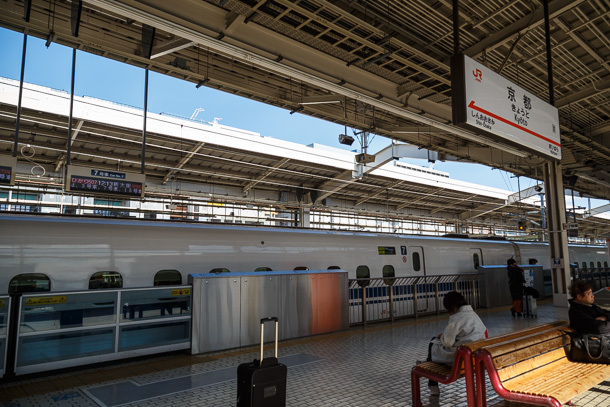 It turns out the same train is also the next going to Yase-Hiezanguchi after it reverses at the terminal, so I end up with plenty of time to check out all of the interior decals as we rattle along to the end of the Eizan Main Line. 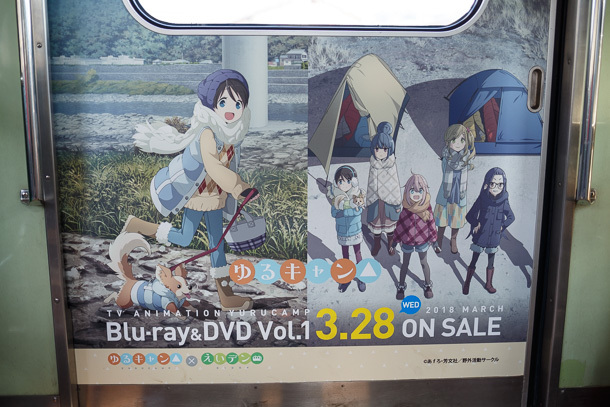 There had been a large display featuring character panels and real camping equipment setup in a free space at the edge of one of the Yase-Hiezanguchi platforms around the time Yuru Camp premiered, a few weeks before our visit. 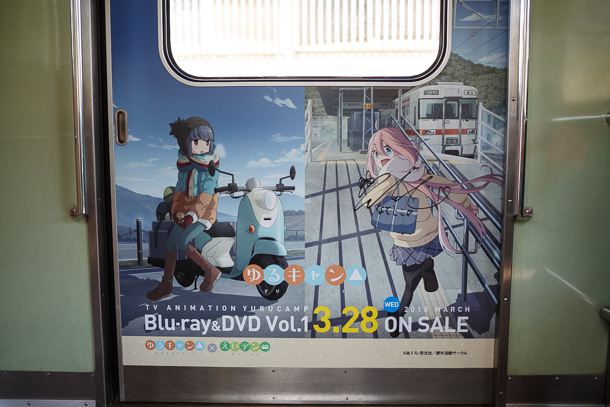 Unfortunately it has already been disassembled and removed when we arrive, though there are still posters in the station. Neither of us have been here before, so we take a walk around while we wait for another train. 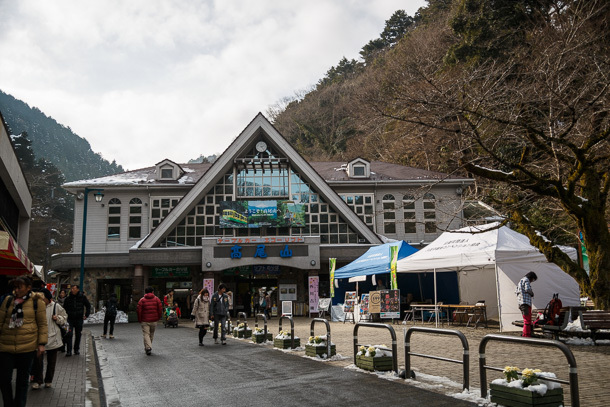 The Hiezan Cable Car station is nearby, for people heading over the mountains to Ōtsu. 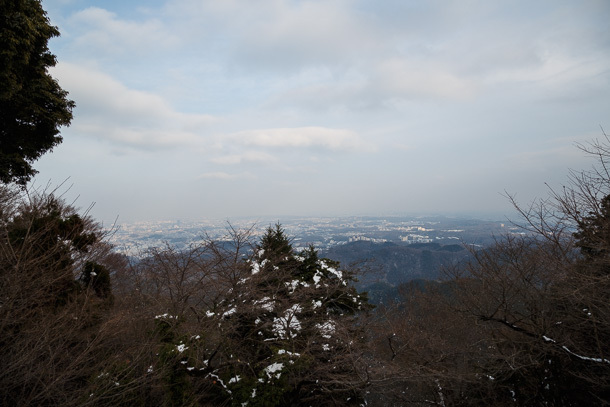 After changing lines at Takaragaike, we head all the way up to Kurama. 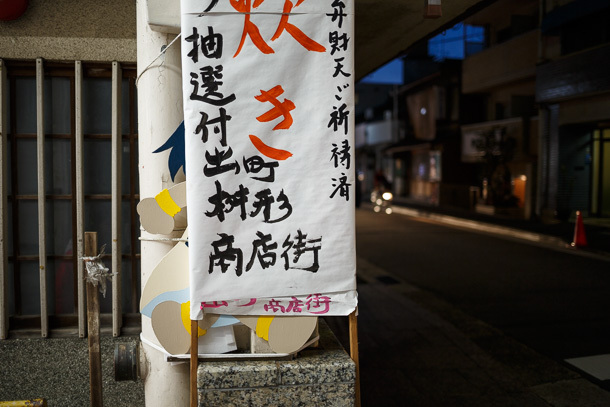 Eiden has often featured marketing campaigns and special events in collaboration with Uchōten Kazoku. 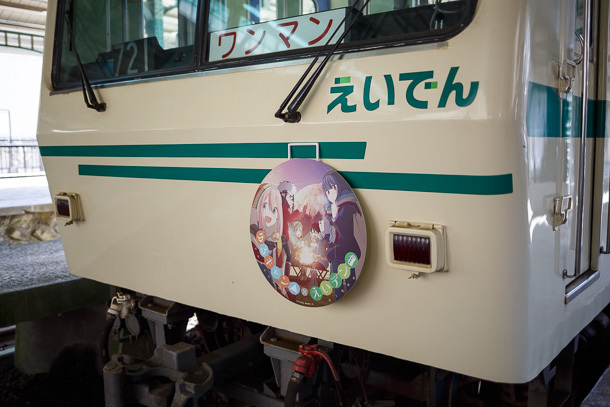 Some of the character panels and an old train cab modified to look like Yajirō have taken up permanent residence at the end of the Kurama Line. 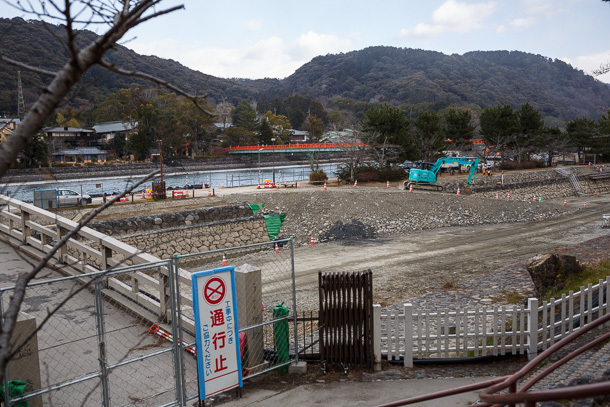 You really can’t beat the public rotenburo at Kurama Onsen. 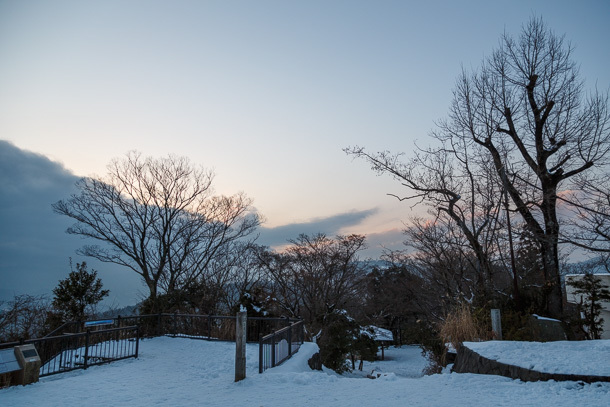 For not a lot of money you can enjoy the outdoor hot spring bath while gazing up at the mountains and watching the sun set. We even get dusted with a light snow while we’re here this time. Heaven. 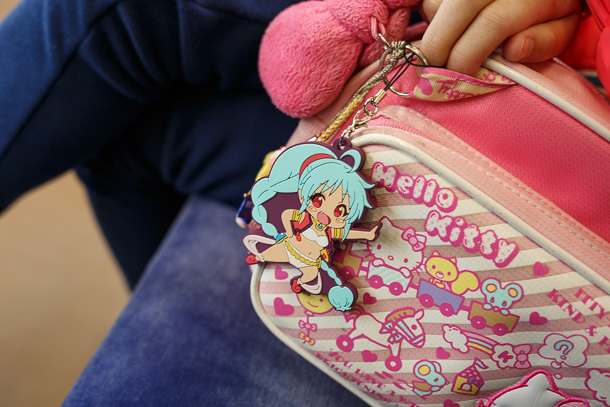 We find Shima Rin! 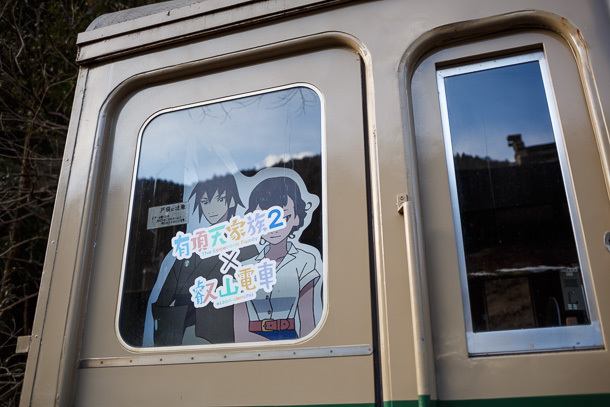 She’s hiding inside Kurama Station. 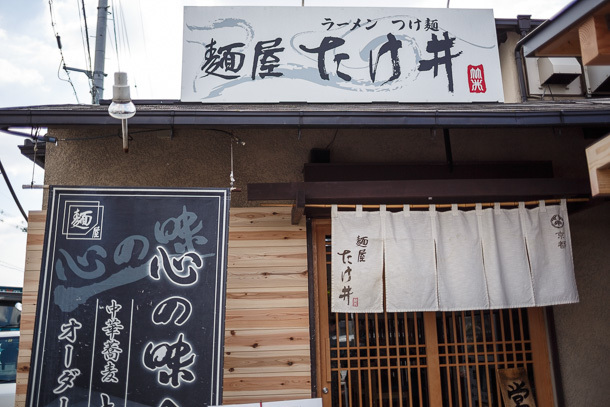 Our original plan for dinner had been to stop at the Masugata Shōtengai again to buy some sashimi from Inoue’s shop to take back to our hotel. 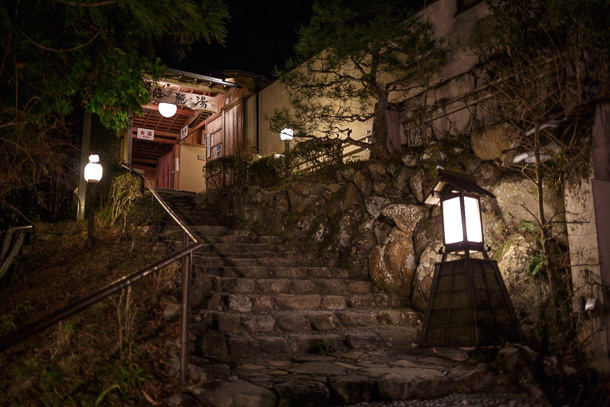 We end up returning from Kurama too late and miss him, but the cafe in the arcade is open. It turns out to be a happy accident. 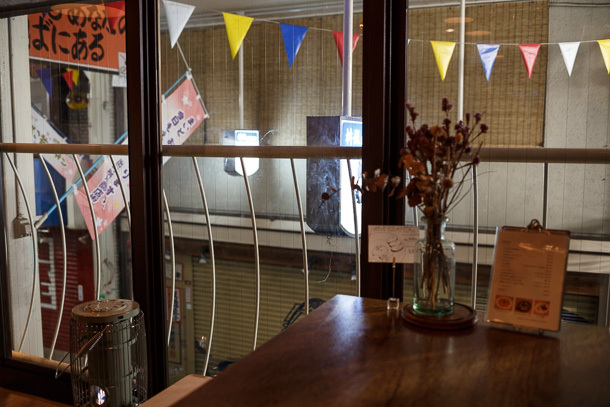 Back in the time of Tamako Market, 2013, this space had been a cafe and bar called Hananami. 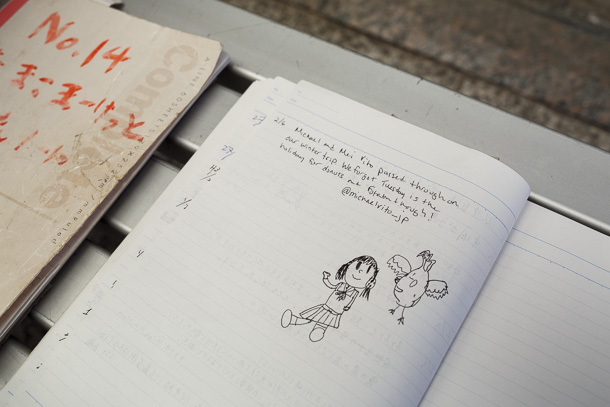 Hananami was a frequent setting in the anime series, where it was called Hoshi to Piero (Stars and Clowns). 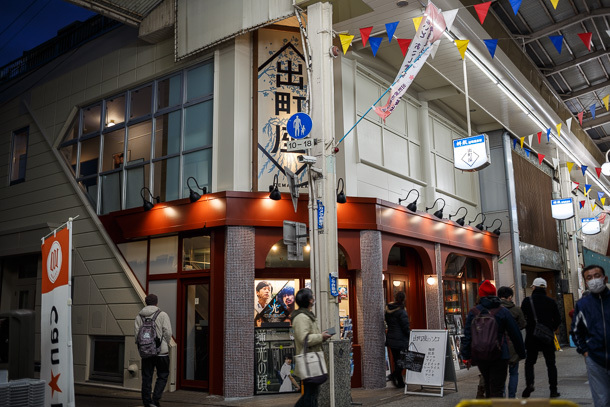 The cafe became the de facto meeting space for Tamako Market pilgrims, hosting gatherings nearly every weekend during the broadcast and for a long while after. 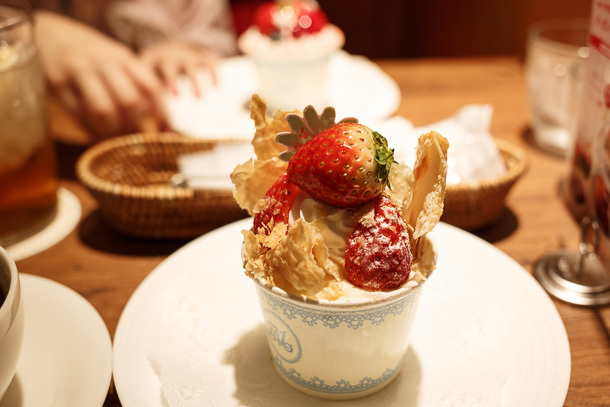 The owner closed the business around the end of 2015, but the space immediately changed hands to my acquaintance Terada Aki and a partner, who remodeled it and opened a new cafe called Chūsenji. I haven’t checked in with Terada since that time, but he exited that project at some point and it is now S.O.U./Violet and Claire, run by Ono Satoru. 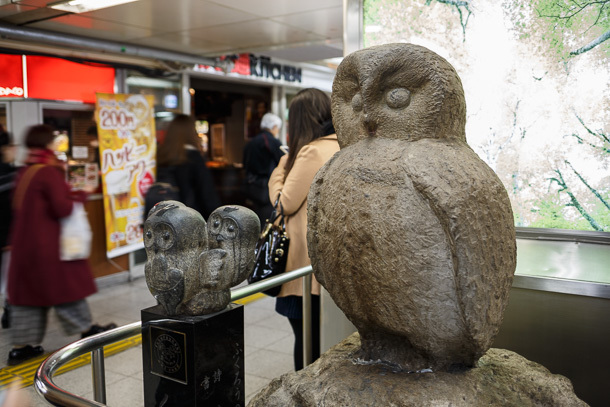 I don’t get around to asking about the convoluted name—apparently you pronounce it ‘Sou’ as if the periods weren’t there—but Ono is friendly and fun to talk with. 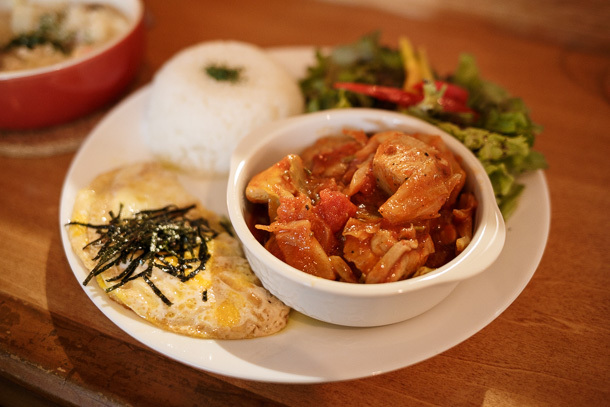 He also whips up some wonderful food, though he’s a one-man kitchen, so you have to be just a bit patient while you wait. 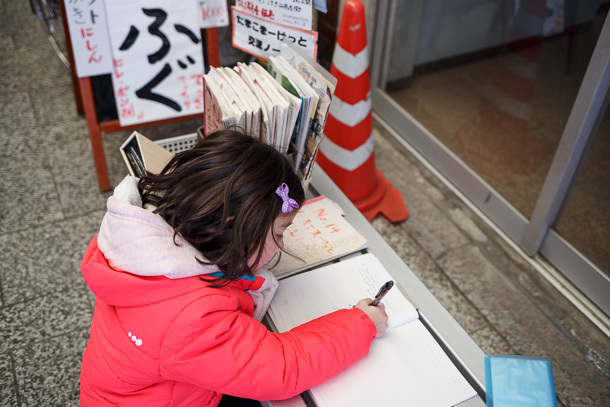 It’s a thrill to see that, though the space was completely renovated and little was retained other than the bar itself, the Tamako Market exchange notebooks have been passed along from owner to owner and remain safe in Ono’s care. Mei and I make an entry, the first of 2018. 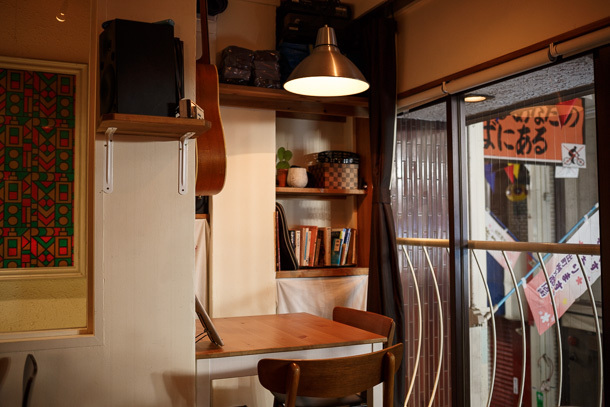 Despite the cramped quarters, Ono manages to squeeze jazz trios in the space next to the window for intimate evening performances. 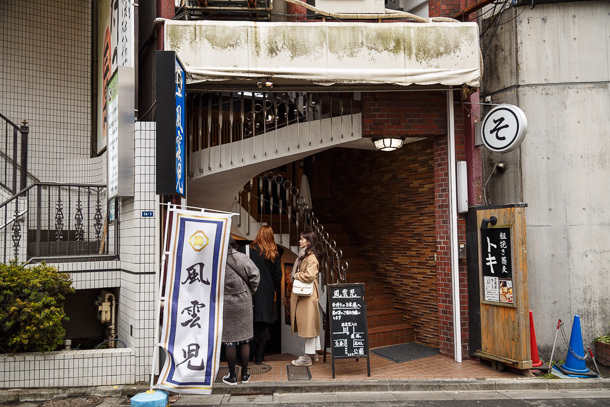 I tell him about how I’ve been studying this shōtengai over the past five years, and that this cafe was where I drank late into the night with a handful of new friends the first time I met Kansai anime pilgrims. 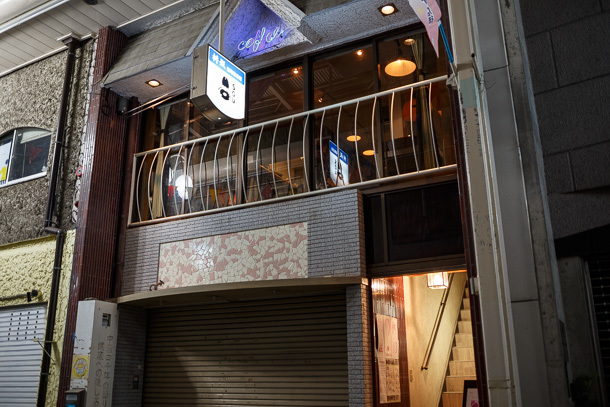 I feel a little like a ghost returning to haunt a former home, but Ono is curious to hear about a small slice of the history of the space he now occupies. It’s hard to stop, there are many good memories here.